The building’s iconic towers have been saved but theblaze gutted its medieval wooden interior, a Cathedral spokesman said. Officialsare considering the blaze an accident relating to construction. The fire, which came during Christianity’s holiestweek and was apparently accidental, left a smoldering stone shell where therehad once been a peerless work of architecture, engineering and craftsmanship. 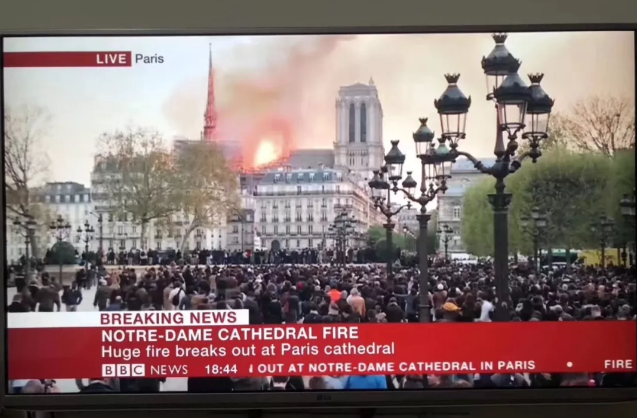 Cathedral spokesman Andre Finot told reportersthat the building had sustained “colossal damage” and that the Medievalwooden interior — a marvel that has inspired awe and wonder for the millionswho have visited over the centuries — had been gutted. “Nothing willremain from the frame,” he said.